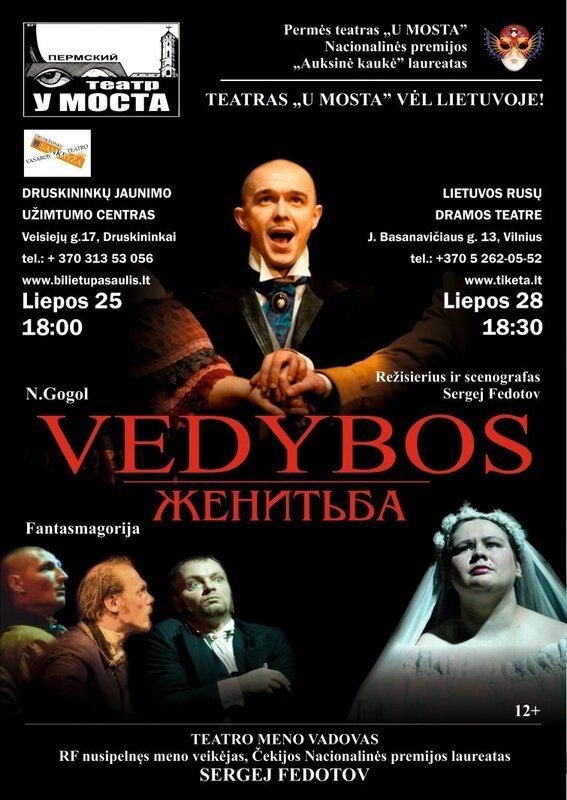 The celebrated Perm Theatre “U Mosta” is bringing a performance of Nikolai Gogol's play “Marriage” to Lithuania. Perm Theatre “U Mosta” is widely known in Europe. It is the only mystic theatre in the world, it is a three times Nominee and the Winner of the “Golden Mask” National Theatre Award, the winner of Grand-Prix at XII International Theatre Forum “Zolotoy Vityaz”, the winner of 35 Grand-Prix of foreign festivals, the Champion of the Theatre Olympics in India, the participant of 141 international festivals and, finally, Perm Theatre “U Mosta” is one of the Russia’s top ten theatres according to the “Forbes” rating. The theatre has toured India, Egypt, Austria, Germany, Poland, the Czech Republic, Bulgaria, Bosnia & Herzegovina, Macedonia, Latvia, Lithuania, Estonia, Hungary, Slovakia, Ukraine, Belarus and many cities of Russia. The founder and the artistic director of the Theatre is Sergei Fedotov, who is also the Honoured artist of Russia, the winner of the Czech Republic National award, the winner of the Russian Federation Government award and the Golden Mask National Theatre award Winner. Perm Theatre “U Mosta” is the Authorial Theatre. It preserves and continues the best traditions of Russian psychological theatre and combines the ideas of repertory theatre and theatre-lab. The exclusivity of Sergei Fedotov’s artistic method is that it aims to develop the traditions of great Russian psychological theatre that is enriched by the discoveries of Mikhail Chekhov’s and Jerzy Grotowski’s schools. “Marriage” (Nikolai Gogol). A phantasmagoria with miracles, incredible logic and unexpected actions appears on the stage instead of a domestic comedy. Kochkaryov is a devil who indulges himself with “devilish tricks”. Doors of the cupboard are opening with mysterious squeaks and Stepan is silently falling through it, characters are suddenly disappearing, deathly blue faces now and then are appearing in the windows (who knows maybe it is the face of the Devil himself)… Numerous phantasmal visions frighten and at the same time bewitch the audience. Gogol´s mysticism unites with his plaintive theme of solitude and defencelessness in the face of the world and life with its eternal trials and contradictions. 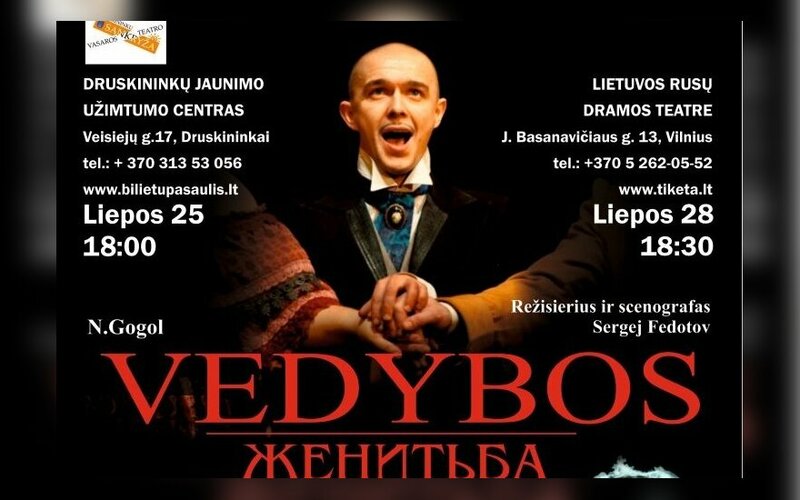 The performance will be shown in Russian with Lithuanian subtitles.